The 3/11 disasters last year spurred the publication of a number of books, including the 2:46 Quakebook project from Our Man in Abiko and Kibo from the number one English-speaking authority on Japanese cooking, Elizabeth Andoh. But this project, based a collection of young adult short stories, verse, and graphic stories, is the most ambitious. It brings together well-known writers with those who are just starting out, and proceeds are benefiting the Japanese NPO, Hope for Tomorrow, which helps young entrepreneurs in Tohoku. The word tomo means friend in Japanese. This book spans basically all the major genres of Japanese literature - from ninjas to ghosts to verse to blog posts and everything in between. You would think that a book that does that would be either academic and huge or completely haphazard. But somehow editor Holly Thompson has managed to put together a book that is not only very current but also unified despite the different styles. The threads of hope and bonds (kizuna) weave through the stories and the varying characters, tying them together without any repetition. This is a young adult book, so naturally the pitter patter of young love is a constant theme and is described adeptly by Thersa Matsuura in The Zodiac Tree and Sarah Ogawa in One. The superstitions of Japan are illuminated well in The Ghost Who Came To Breakfast from Alan Gratz and Yamada-san's Toaster by Kelly Luce. Relationships between teens and their parents are convincingly portrayed in House of Trust by Sachiko Kashiwaba (translated by Avery Fischer Udagawa) and I Hate Harajuku Girls by Katrina Toshiko Grigg-Saito. Somehow, Debbie Ohi is able to pull in all of these elements in her handwritten (graphic?) story, Kodama, and it is extremely accessible due to the format (sketchbook entry). I love historical fiction so The Bridge to Lillooet from Trevor Kew, about young people in internment camps in WW2 Canada playing baseballe with local Mounties, has whet my appetite for more, as did supernatural mystery Staring at the Haiku, about antique dolls who confound young ghostbloggers, from John Paul Catton. The writers are good at introducing other parts of Japanese literature into English as well. Louise George Kittaka shows the cheesy puns beloved of old Japanese men and television producers all over this country. Science-fiction story Anton and Kiyohime by Fumio Takano and translated by Hart Larrabee incorporates an exciting nagauta. Mariko Nagai's poem uses the onomatopeia Japanese verse is most famous for as well as being a joy to read out. Also, I was thrilled to read my first Ainu story, transcribed by Yukie Chiri and translated by Deborah Davidson. Thompson chose to place the disaster-related stories at the beginning of the book and I really appreciate this decision. There is no white-washing of the enormity of this event, but the message I got was that the youth of Japan are going to move beyond it. 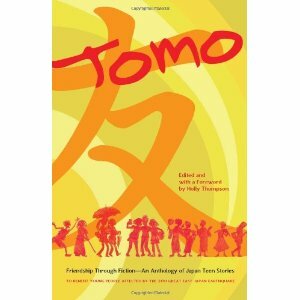 This collection of stories leaves the reader with an amazing sense of hope for the future of Japan. I reviewed Love Right on The Yesterday by Wendy Nelson Tokunaga for Short Story Monday last month. I had thought that probably this was the best and that's why it was released early - but it's nigh on impossible trying to pick the best. This is not only a great book commemorating the spirit of the Tohoku people, it is a darn good read, and the English book I would recommend first to anyone who wants to dip their toes into Japanese literature.